Two babies, three cities, five houses, six years of marriage, and a whole lot of love. Our story has been a bit windy, a bit scary, a bit adventurous and always fun. When I was a High School English Teacher, I started refurbishing, painting and refinishing furniture and selling them on my Facebook. This grew quickly and I was soon able to stay home and make a little side cash. I was blessed with a quiet life of painting furniture and playing with my babies. We loved Corpus, but Kevin was offered a job opportunity in Dallas, so we took a chance and headed to the “Big D”. When moving to Dallas our Realtor was contacted by HGTV Magazine asking to have our house in their magazine; this really boosted my decorating and design confidence. In Dallas my furniture side job grew into a design job that offered furniture refinishing as part of the my skills. But Dallas was not home to us, so Kevin asked me, if we could move anywhere, where would it be? We rolled out a map and picked our favorite places and that’s how we ended up in New Braunfels; our version of living in paradise. We are river people. However, owning a shop was not exactly on my plan for the next year or two. After a long weekend at Wurstfest, Kevin decided we needed a Blizzard and to go for a nice ride. Cruising along we found the shop, it was empty and needing love, but we knew the potential for that location. 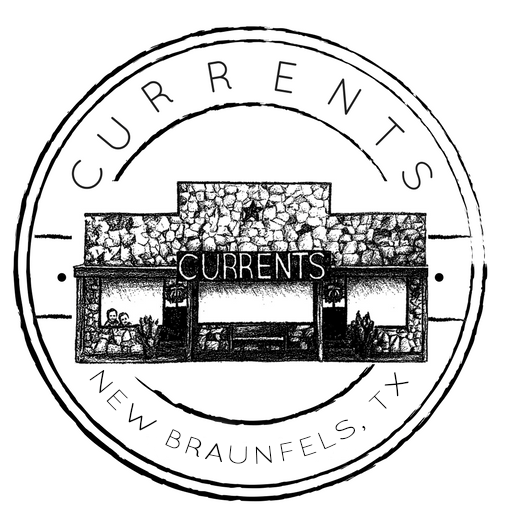 So we opened Currents! Life is too short to not take chances, to not love each day; So Jump! Then learn how to swim once you land in the current…it’s more fun that way. Your ideas will shift and change direction throughout the creative process, I’m here to help steer you in which ever direction you want to go and be your anchor when you have found your style. So don’t fight the Currents and come visit me.